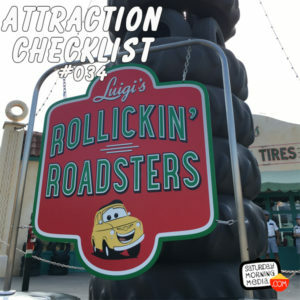 http://www.attractionchecklist.com – It’s time to take a drive to Cars Land at Disney California Adventure and ride Disneyland Resort’s first trackless attraction, Luigi’s Rollickin’ Roadsters. Joining the fun, for his very first ride on this attraction, is John B. deHaas. After we ride, we discuss our thoughts on this ride that has stood the test of time. Recorded on June 22, 2016. It’s time to take a drive to Cars Land at Disney California Adventure and ride Disneyland Resort’s first trackless attraction, Luigi’s Rollickin’ Roadsters. The guide map describes this attraction in the following manner, “Luigi’s Cousins from Italy are in town to perform their favorite dances and you get to go along for the ride.” There are no height requirements for this attraction and the Thrill Level describes as Luigi’s Rollickin’ Roadsters as being a Thrill Ride with spinning and also cautions it as being loud. Before we take a spin for ourselves, here are five fast facts about Luigi’s Rollickin’ Roadsters. 1. Luigi’s Rollickin’ Roadsters opened in Disney California Adventure on March 7, 2016. The attraction was a replacement for the Cars Land original attraction Luigi’s Flying Tires. 2. As mentioned at the top of the show, this is the first attraction at Disneyland Resort to utilize a trackless vehicle system, meaning that as the cars move and spin around the quote/unquote dance floor they do so without the aid of any sort of track system. There are 18 different paths that each car can take at any time making each ride on this attraction truly different. 3. The attraction features Luigi and his cousins singing several car themed takes on classic Italian songs. The songs play randomly lending even more to that ‘every ride is different’ feel of the attraction. 4. Half of Luigi’s cousins, the ride vehicles’ are male and the other half are female. Grill mustaches on the male cars make it easy to tell the difference. Each of the ride vehicles also has its own name and each of the cars is unique except for two ‘twin sister’ cars, Rosa and Gina, but even they are different as they have different color eyes. 5. In September of 2017, it was announced that Luigi’s Rollickin’ Roadsters would receive a Halloween Themed Makeover called Luigi’s Honkin’ Haul-o-ween complete with brand new spooky songs and halloween decorations. Now it’s time to join Luigi for his race day celebration and ride Luigi’s Rollickin’ Roadsters. John B. deHaas is along for the ride today and it’s his first time on this attraction. Stay tuned after the ride audio to hear our thoughts on this attraction and this is a binaural recording, so put your headphones on now. This is Disney California Adventures’s Luigi’s Rollickin’ Roadsters.